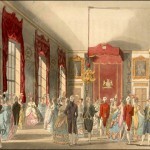 Fashions of London and Paris, May 1798. This print is not of very high quality, even for this magazine, but it is nevertheless very useful. 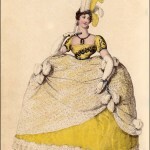 We can see that the waistline is not as high as it will soon become, so that this dress looks more like a dress from 40 years earlier, and not quite as odd as the high-waisted Regency court dresses. 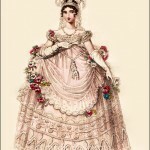 Most prints show the court dress straight on, so that it looks like a wide circular hooped gown. 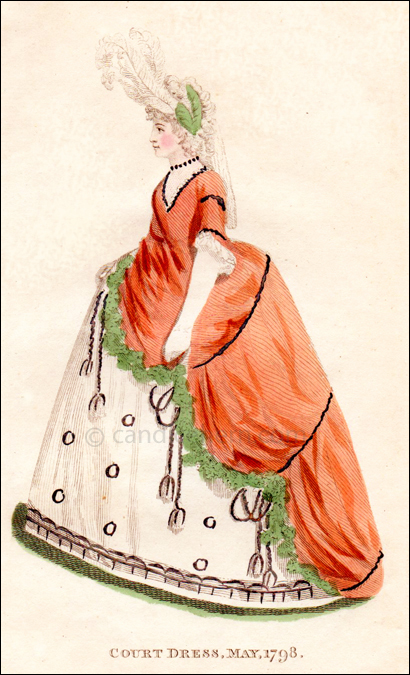 This print shows the figure at an angle that allows us to see that the dress is indeed like one from decades earlier, with a flat front and wide panniers on each side. The bits that appear dark gray online are actually painted in shiny metallic silver paint.